How often have you found yourself in a situation where you were in a hurry to find your garage door won’t open with remote seemingly not responding to your commands? You would be surprised how often San Diego homeowners complain about the same issue. If you want to save time and money on repairs, we recommend troubleshooting the issue first. You should attempt to find the problem yourself only if the door was closed in the first place. If the door is open and won’t respond, it is best to contact an emergency San Diego garage door repair company, as attempting to manually close it can be extremely dangerous and result in expensive damage and possible injuries. If the door is closed and won’t open, you can try troubleshooting the problem on your own. 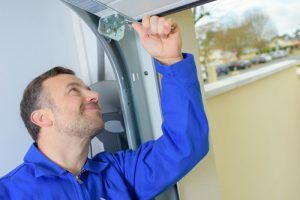 Our experts have compiled a few common problems and how you can check if they are what’s behind your garage door malfunctioning. If your garage door won’t open, the first thing you should try, no matter how silly it may sound, is to check whether the remote is within the range of the receiver. Try moving the remote closer and closer until the door opens. If this fails, check the switch on the wall next to the garage door to see if you can open it that way. If the switch works but the garage door won’t open with the remote, try replacing or recharging the batteries in the remote. If this still doesn’t fix the issue, try reprogramming the remote. Finally, check the power source of the door. Check that the motor unit is plugged in and that everything is in order with the circuit breaker and the fuses. Find a red rope with a handle connected to the trolley. The trolley is the part of the mechanism holding on to the door as it opens and closes. Pull the rope down to disengage the trolley. Your door should be able to move freely now. If you want them to stay disconnected, pull the rope down and towards the motor way. When you need to reconnect the mechanism, pull the rope again and move the trolley from the connection point and towards the garage door. Lift the door and reconnect the trolley to its attachment point. If the power supply is not an issue, you can activate the motor and it will automatically re-engage when the trolley meets its attachment point. Again, we warn you that tampering with a garage door that isn’t completely closed can have serious consequences, which is why it might be best to leave troubleshooting to experienced professionals. In order to make sure you never experience such an issue when you are in a hurry, you should schedule routine maintenance with a professional San Diego Garage Door company. Rockstar Garage Door Services can perform quick and professional maintenance, including cleaning the tracks, lubricating the mechanism and replacing worn-out parts with durable, high-quality ones. If you experience any issues with your garage door, don’t hesitate to reach out to us at (619) 930-9854 or through our website form.